ALIEN ABDUCTION OF AN ELK IN WASHINGTON STATE. Shortly before noon on the last Thursday of February, 1999, fourteen forestry workers had just broken for lunch and were heading for the crew vehicle. Francisco and Augustine were nearly at the turnout (1900 ft. elevation), Manuel and two others were walking up the slope (about 1600 ft. elevation) from an old overgrown access road, while the rest of the crew was scattered, most midway between the two groups on the north-facing hillside. Francisco stopped to rest momentarily and watched the 14 elk of a herd that had been browsing all morning on a nearby slope northeast of them. Then, out of the northeast, he spotted a strange moving object. The UFO, presumably, had already dropped some 70 feet down the height of the Douglas Fir trees bordering the dirt road and was now drifting over a hilltop. Skimming the clear-cut at brush top level and hugging the contour of the hill, the UFO appeared to be heading slowly toward the herd of elk. The object’s initial location was approximately 800 yards distant and 200 ft. lower in elevation than Francisco’s location. At first Francisco mistook it for a bi-colored paraglider silently drifting in for a landing. The object had a strange, slow wobble. It showed red on the right half, white on the left. Francisco quickly realized that he was not seeing any type of parachute. The clear-cut terrain prevented rapid movement for the animals: innumerable small deciduous trees had trunks cut about 18″ above the ground, transforming them into sharp stakes pointing skyward. The trunks, bristling with branches, lay helter-skelter, presenting criss-crossing barricades. The lone animal could not run fast. The wobbling craft, moving no faster than between 5 and 7 mph (est. ), easily overtook it. Augustine had missed the pursuit but caught sight of the UFO as it took the elk. Down-slope, Manuel (crew supervisor) also witnessed the capture-500 yards distant. Nearly every other person’s attention had been diverted toward the main group of fleeing animals. The craft moved directly above the female elk and somehow lifted it into the air without any visible means of support evident to the observers. The captured elk, its head apparently against the ventral surface of the craft, and body standing stiffly upright, was lifted off the ground-just enough to clear the underbrush. The craft continued its slow, wobbling oscillation. The suspended elk moved likewise as if she were a solid metal sculpture welded to the craft. After the craft acquired (without pause) the animal, it moved away at the same slow pace, to the north, following the contour of the land. The elk’s feet were observed sweeping circles, in conjunction with the craft’s movement, just above the brush and tree tops. Within a short time the craft approached the forest edge that defined the end of the clear-cut area. Apparently the craft did not stop or maneuver in time to avoid hitting some of the lower branches. Because of the considerable distance of the craft, the witnesses could not discern exactly what had hit the trees-whether the craft, the elk, or something else is unknown. After hitting the branches, the witnesses saw it dip sharply and reverse direction before ascending vertically in front of the tree line. All three had the impression that the object had almost dropped the animal. Once above the tree top level, it moved over the forest margin and continued northward, dipped out of sight momentarily (perhaps still following the contour line of tree tops), then ascended at roughly a 45-degree angle into the distance until it was obscured by clouds. Meanwhile, the rest of the herd had gathered into a tight huddle near the tree line, a normal behavior when a predatory threat is perceived. This herd consisted of cows and yearlings. The bulls at this time of year stay in bachelor groups at a higher elevation. The huddle lasted for two hours. The witnesses shared their story among themselves at lunch. Several of the workers that had not sighted the craft expressed doubt that anything extraordinary had happened. Nevertheless, the reactions of both the elk and the excited co-workers evoked fear, generating a tense emotional atmosphere. The humans, analogous to the elk’s behavior, consciously stayed in close proximity for the rest of the afternoon. Even those that doubted the story knew something had happened and were not comfortable working far from the rest. NOTE: The above image is a rendering. It was late March of 1967. I was in the army at that time, and assigned to an air defense center in Key West, Florida. I spent many of my nights in a radar control center watching the various screens. My second cousin was also in the scope dope business. He was in the Air Force at the time and worked in a radar station in Homestead, Florida, just outside Miami. We spent many an evening conversing on the air defense net, although our conversations rarely had anything to do with air defense. My cousin called me one night on the net and advised me that something unbelievable was happening in South Florida. He opened the net so I could monitor the traffic regarding the incident taking place. I pulled my headset to my ears as I listed to various NORAD stations tracking a UFO just of the coast of Miami. At the time, Homestead was a SAC base, and any such traffic was a great concern to the Air Force. Although I was about 100 miles from the target under discussion, I had the capability to observed activity in the area with my own radar. I had only to take it off standby. As I was bringing up my antenna, the chatter continued, and referred to three more objects in the sky near Miami. It was also noted that civilian observers had now sighted the objects and the sighting was being reported on local commercial radio. As my scope came up the first thing I noticed was three Marine fighters departing Boca Chica Naval Air Station, heading North. The UFOs were clearly visible just Southeast of Miami. They appeared to be moving just East of North, skirting the Florida Coast. They then turned sharply West, crossing the keys near Everglades National Park on the south tip of the Florida mainland. It only took the Phantoms a few minutes to reach the area of the bogies. I have no idea if the pilots sighted the targets visually, or electronically. The air channel was not part of the NORAD net. As the phantoms approached the targets they disappeared off the scope. Now there is only one way to disappear when being observed by a PAR (pulse acquisition radar). You must go straight up, or straight down. This cat and mouse game went on all night. Much to much to type in this report. Visual observations in Miami reportedly included the observation of one large object and three small. This I can not verify, although I imagine the Miami Herald would have some record of it. To me, they appeared to be flying a search pattern. The way the Coast Guard would search in grids. After about four hours one of the unknowns began moving South directly towards my location. The target was really moving, probably twice the speed of anything I had ever tracked, around 1100 miles an hour. This would provide me with an excellent opportunity to lock onto the target with a different type of radar. 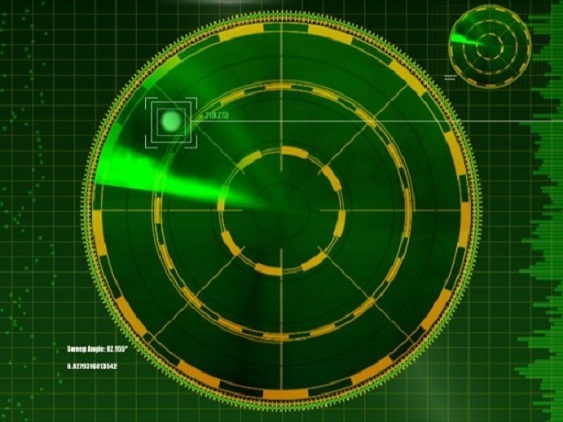 This other type of radar, which I probably should not identify, has the capability of bringing back actual sounds of the target . Turbo prop, jet engines, or the thud of rotary aircraft could clearly be heard with this system. 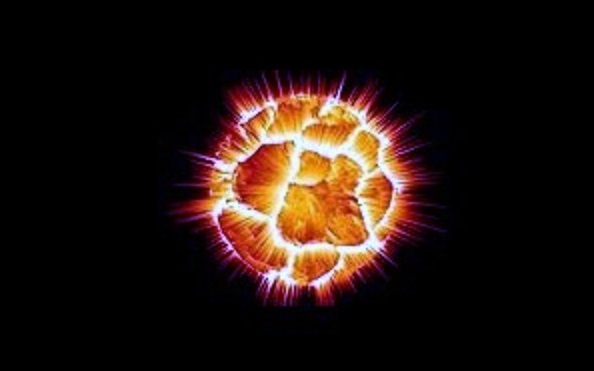 As the target approached it decelerated but was still super sonic. I brought the targeting radar into alignment with it and brought the unit on line. For a short moment, a very short moment, I could hear a high pitched whine, similar to a jet engine, but smoother and much higher pitch. At this point the target obviously detected my lock and hit my sight with some type of Electronic Counter Measure. It appeared to reverse the polarity of every piece of equipment on the sight, although I was never able to verify that. Needless to say this caused an instant shut down of the system and erased a great many taxpayer dollars. As I was exiting the control center the launch crew stated that they had seen the object pass over. It was moving so fast that one of the guys swore it was a meteorite, but was flying level. When last seen the object was headed South towards Cuba. It was many years later that I read newspaper articles about a two week flap in the Miami area. I would also later learn about a Cuban MIG21 that was allegedly destroyed during an encounter with a UFO in March 1967. NOTE: The above image is a rendering. Jan C. Harzan comments: I received a call recently from a retired TWA pilot who urgently needed to speak with me. He introduced himself as a commercial airline pilot with 48 years of flying experience who had had two incredible sightings during his career as a pilot that he now felt comfortable talking about since he was retired, but that was not what prompted him to call, it was a more intriguing story that I will share with you in just a minute. He started off by sharing a report of being the co-pilot on a TWA flight from Saint Louis to San Francisco; the flight had been delayed several hours due to mechanical problems, but finally got off the ground late in the evening heading west. As the flight approached the state of Nevada, Air Traffic Control (ATC) broke the silence stating that traffic was in the area and requested they make an immediate 90 degree turn to the north and wait further instructions, an odd request at nearly 1 am and 36,000 feet. Usually little or no air traffic existed at this hour of the morning, especially at this altitude. They immediately followed the instructions given by ATC. As they were heading north he happened to look down and see what appeared to be an ILS turn on, on the dark desert surface below. For those who are not familiar, an ILS is an Instrument Landing System. This ILS was different though, it was a 3-dimensional hologram, something he had never seen before as an airline pilot. It was also blue with violet light crossing at 90 degree angles. The next thing he noticed was that in the upper right hand corner of their cockpit windshield there appeared to be maybe 20-30 firefly type lights flitting around way up high in the sky; they then began making hard right angle turns and shot one after the other down the holographic ILS until every one of them was on the ground. Then the ILS turned off and it was pitch black again on the ground. He turned to the pilot and asked, “Did we just see that?” The pilot looked at him and answered, “No sir, we did not.” ATC then came back on the radio and said that they were now clear of any traffic and gave them a new course heading to San Francisco. The exact location of where the holographic ILS opened up and the lights in the sky made hard right angle turns to land was Area 51 he told me. The year was 1988. I was in my bedroom watching Sherlock on my laptop when a bright object caught my eye out of the window. I observed it for about 30 seconds. It was a very bright light with a searchlight emitting from it. The searchlight varied as it would scan the ground for a few seconds then it would point to the clouds. I ran out side to get a look at this object. As I looked at it I could start to see an object that look like a diamond with 2 red orb like objects orbiting the diamond. The object brightened with no searchlight from it, I realised the searchlight was on me. I started to hear a low hum. It was the metal railings surrounding me vibrating the searchlight then swung around and pointed towards the sky. I could see the light cast on the clouds. The object then continued on it path start along to North west then it shot off. I went back inside and when I looked out of the window at the top of the stairway the object was low on the horizon hovering there gradually getting dimmer. I took out my phone and I recorded the object for a few seconds til my battery died out. The object is still on the horizon as I write this nearly 2 hours after the encounter. I had a very head ache after the sighting I’m not sure if it is linked to the searchlight on me or if it is just coincidence. I’m not sure if it is alien or if it is just so weird weather stuff all I know is it is not a helicopter there was noise and a helicopters isn’t diamond shaped. 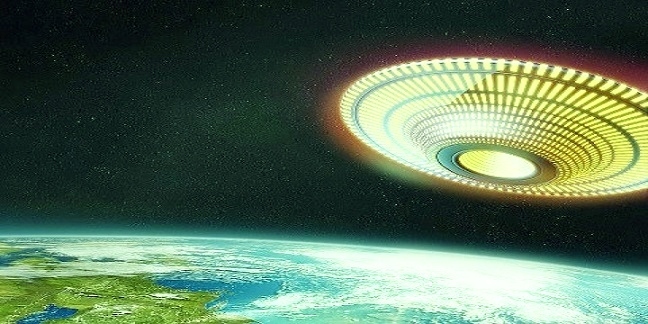 I saw video from west africa were a diamond shaped craft fixed a beam of light on a village and it like transfix them. It could be linked I don’t know. I have had two other encounters prior to this. Both was a single green orb like object performing acrobatic maneuvers such as moving in a triangular path in the sky and making angles at such high velocities that it would kill a human with the amount of g force. NOTE: The above image is a rendering. During a scheduled execution in Tasunokuchi, Kamakura, Japan, a UFO appeared and scared off the populace. According to reports, “There appeared in the sky an object like a full moon, shiny and bright.” The intended victim who was to be beheaded, a well-known priest named Nichiren, was spared. Strange lights were seen circling over Constantinople the night before the Turks conquered it. Some of the lights flew straight up at high speed and then split into many smaller lights. 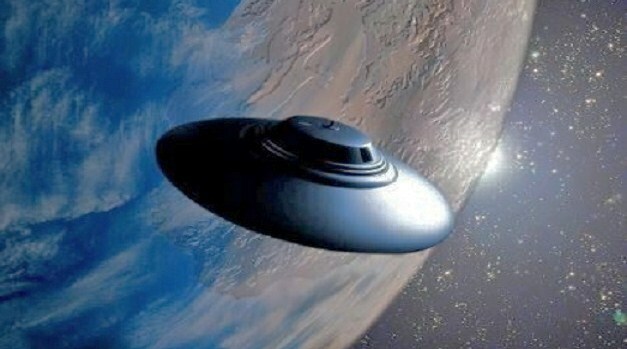 A large object making a “sound like a wheel” flies out of Mt. Kasuga. None of the citizens had seen anything like it before. A large “comet” is reported flying over Arabia. 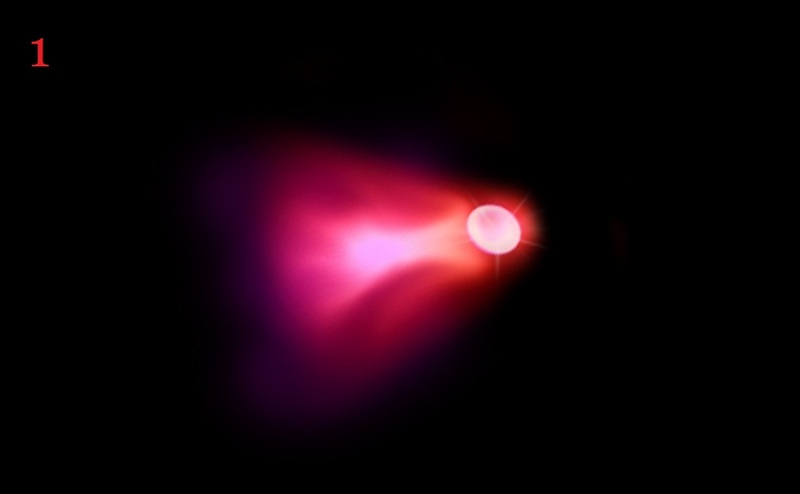 The comet is reported as having numerous windows on it. 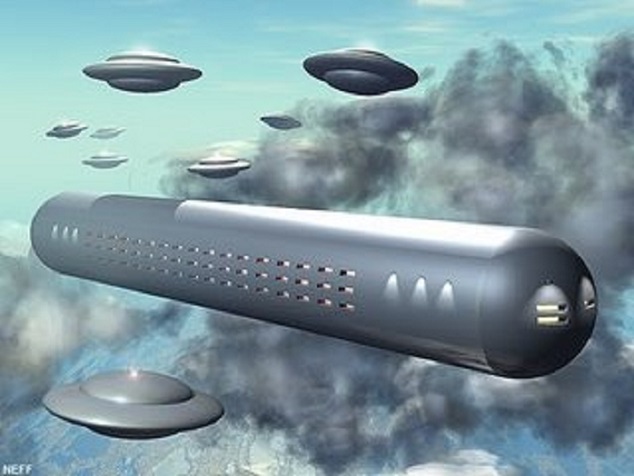 Over two hundred large cylinders, globes, and “spinning disks” flew over the skies of Nuremberg, Germany. People also reported seeing red, black, and orange globes, as well as “smoking spheres” coming out of the cylinders in the sky. Large numbers of “spinning fireballs” are reported over Kyoto, Japan. A “whirling, red wheel” hovered over the Nijo Castle. The Samurai guards were put on alert. A ball of light was seen by the citizens of Robozero, Russia, in the middle of a cloudless day. The ball was brighter than the sun. A large ball flies across the sky in Leipzig, Germany and two smaller, glowing balls come out of it. In Sheffield, England, Thomas Short described the following: “A dark red cloud, below which was a luminous body which emitted intense beams of light. The light beams moved slowly for awhile, then stopped. Suddenly, it became so hot that I could take off my shirt even though I was out of doors.” Note: this event occurred in the middle of December. A similar object appeared on the same day over Romania. Old manuscripts described it like this: “There appeared in the West, a great sign in the sky, blood-red and very large. It stayed in place for two hours, separated into two parts which then rejoined, and the object disappeared towards the west. Three globes “like the moon” appeared over Japan. People were so frightened that riots broke out. To try and calm things down, the government ordered anybody rioting “because of the globes” to be executed. Later “three moons” appeared. Days after that, “two suns” appeared. In Sweden three objects “like the moon” appeared in the sky and stayed for four days, then vanished never to be seen again. In another incident that same year, a luminous globe appeared at night and projected beams of light out of it. These seemingly minor incidents are quite remarkable because there was nothing in the skies in 1766 that could project a beam of light, except sunbeams coming through clouds. NOTE: The above image is a rendering. Standing on back porch in Porter Corners NY, a suburb of Saratoga Springs and noticed bright object in sky larger and brighter than anything else. Object abruptly made fish hook turn heading in opposite direction towards moon. Screamed for my friend Ben as I immediately knew this object was under intelligent control and not of current technology. Object went a short distance and stopped dead and hovered for a few seconds and then streaked back the opposite way passing an on coming airplane at at least 20 times the airplanes speed. Made the plane look like it was standing still. 5 minutes later 7 fire and police vehicles came roaring by blazing their horns and sirens. Lived here 8 years and have never seen more than three or four go by. Chased them down and found them down a side road and were told to leave that it was just a fire??? Sounds a little like Kecksburg to me. NOTE: The above image is a rendering. I looked up to the sky for no real reason and thats when I saw it. A white cigar-shaped object very high in the sky, probably at about 20,000 feet in altitude. The object was heading south/southeast and clearly had no wings. It was just a plain white cigar-shaped image with what looked like an aura of light around it. After watching the object for about ten seconds it occurred to me that this was not a normal aircraft I was seeing so I grabbed my cell phone to see if I could take a picture of it. At this time the object had traversed only about a quarter of the visible sky and I thought it would take another 20 seconds or so before it would be out of sight. I looked down to pull up my cell phone camera and when I looked back at the sky the object was already gone! This was only a few seconds later and I wondered at how the object could have disappeared so quickly since it was still in the middle of the sky when I looked away. It should still be there, I thought. Either way, the object had vanished completely and was seen no more.A minute or so later a commercial jet was seen heading east. Even though I could see only the profile of the jet, the wings were clearly visible. This is the part that made me think that I really had seen something strange because when the other object passed directly over head, any wings on it should have been easy to see against the open sky, but there were none. It was daylight when this sighting took place and no flashing lights were seen on the object, but the same could be said about the jet that followed. If the first object was a blimp, what was it doing so high in the sky and how could it have disappeared so suddenly? Beyond that, the object was moving much too quickly across the sky to have been a blimp or similar known flying object. Call me crazy if you must, but I think I just saw a UFO! NOTE: The above image is a rendering. James Flynn of East Fort Myers, Florida, an experienced woodsman, headed deep into the Everglades with his four hunting dogs. He had planned to spend several days there. On the night of the 14th his hunting dogs took after a deer. Later, hearing a sound like a gunshot, Flynn started up his swamp buggy and headed off in search of his dogs. One of his dogs had returned, which he had placed in its cage, and it accompanied him on his search for the others. Around 1 a.m., on Monday, March 15th, Flynn spotted something unusual that he judged to be slightly over a mile away. Whatever it was, it was hovering, shaped like a broad, upside-down cone, an estimated 200 feet in the air above some cypress trees. After a while it began flying off toward the Northeast. After some 2 to 3 minutes, it returned to the same place, and hovered again, this time for an estimated 5 minutes. Then it took off toward the Southwest at a high rate of speed. Soon, however, it returned to the same location again. At this point, Flynn was only about a quarter of a mile away, and the object seemed to come down among some trees into a small knoll. Flynn figured, up to this point, that he was observing a helicopter of some sort, but then he began to study it through a pair of binoculars and he realized that he wasn’t looking at a helicopter at all. Then he began to suspect that it was some secret craft from Cape Canaveral. Flynn described the object as some 25 feet high, and twice that in its diameter. Up near the top were four tiers of two-foot-square square window-looking sections that emitted a yellowish glow. The thing was metallic, and seemed to be made of four-by-four plates that appeared to be held together with rivets. Around the base there was an orange-red illumination that seemed to cast a glow on the ground some 75 feet around its rim. Sometime later he regains consciousness. Finding himself initially blind he lays there for a long while until he recovers a small amount of vision in his left eye. By this time, the sun is shining and its Tuesday morning. Flynn gathers up his dogs and makes his way to the home of Henry Osceola, a Seminole Indian who lived there in the Everglades swamp. It isn’t until noon Wednesday that Flynn returns home. He and his wife go immediately to pay a visit to ophthalmologist, Paul R. Brown. Dr. Brown finds Flynn’s vision 20/800 in his right eye, 20/60 in his left eye. He notes a slight bruise over his right brow. The left eye appeared normal, but in the right eye he could not see the retina. Flynn complained of hearing reduction and numbness in his arms and hands following the encounter. Under careful observation and treatment by Dr. Harvie J. Stipe, a physician who had known Flynn for 25 years, Flynn was treated, and soon those symptoms disappeared. On March 26, Flynn, Dr. Stipe, and two others, returned to the encounter site in the Everglades, and there found a burned circle some 72 feet across. The circle looked like it had been swept clean of leaves, twigs, limbs — normal forest debris. Eight cypress trees were scorched from their tops down to about halfway from the ground. 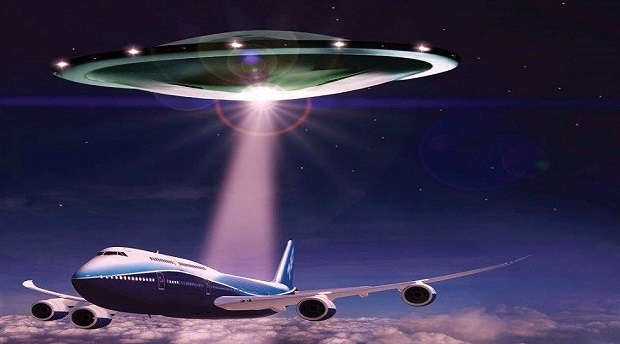 In October 1966, in a phone interview with Arizona physicist James E. McDonald, Flynn stated that the UFO was probably, he figured, some secret aircraft of ours, and that if he could ever prove it then somebody would pay for the good eye he used to have. In July 1996, Flynn made a rare public appearance at Port Charlotte, Florida, where he stated: “I’m waiting for the day someone turns up the truth about this thing. I hope I live that long.” NOTE: The above image is a rendering. I was driving home heading east down warwick ave. I notices lights over the field. At first I was, holy crap it’s a plane about to crash, but then as I got closer and I realised it wasn’t moving, and slowed down trying to figure out what I was looking at. I came to a complete stop and I was staring right at a large ship. I knew this was no plane or blimp or anything i’ve seen in my life. It was so shiney like fresh polished crome and was triangular and had a smoth curve on the top that was shiney but very dark like black. There were red lighs that stayed on and white lights that were so ultra white on the sides. It seemed like it only illuminated the craft, nothing around it was illuminated, and the relection from the white like pulsated off the craft as well as green lights that did the same but at the bottom. 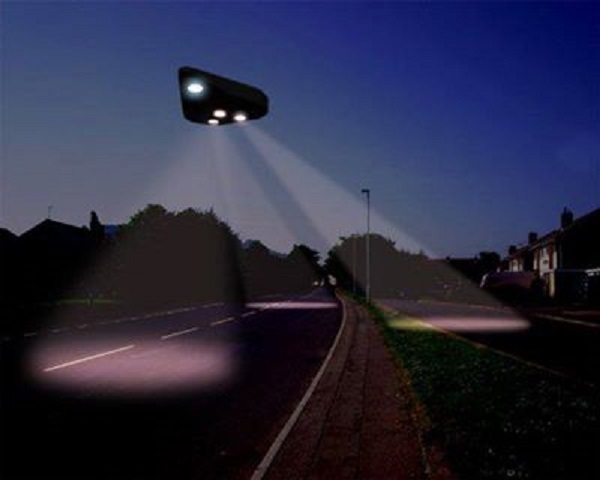 When I was further up the road the lights seemed to span out in the air, when I was stopped it was just the craft pulsating, there was no noise at all. At first I was confused and when it sunk in what it was I was in awe then felt very uneasy, I got nervous. Its a very dark road and I saw headlights in both directions so keeping my eye on it constantly looking back I made u turn to go back and tape it. I looked away for a few seconds to make the turn and it vanish. I felt alittle scared. I drove all the way back down the road very slowly there was nothing in the field or in the sky, not even a light in the distance. There were two people who were walking down the road who were now running. I was completely freaked out at this point and turned around and went back down the road again to go home, still not a thing in sight. There were 2 people walking and atleast 3 other cars passed. There’s houses on the road and also a high school. I hope more witnesses come forward. It was truley an experience to be so close and get such a good look. I have goose bumps writing this. NOTE: The above image is a rendering. KEN PFEIFER OF MUFON RHODE ISLAND. All information pertaining to aliens might be well-versed to a select public audience, but for non-believers, the history of NASA Astronauts who have sighted UFOs may come as news. 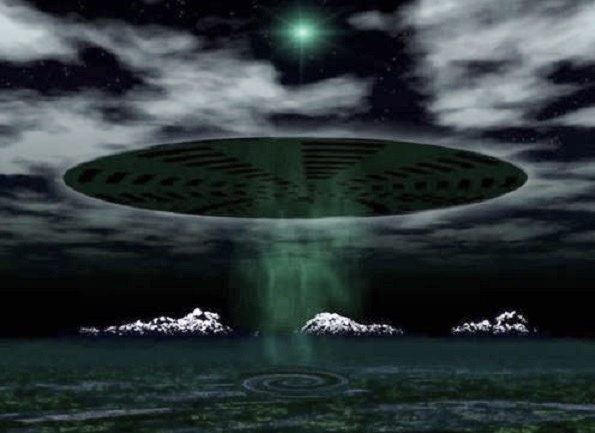 An anonymous site with domain, syti.net, documents several astronauts who have allegedly made claims to have encountered UFOs during their work. Major Gordon Cooper is said to be one of the first Mercury astronauts and last American to fly in space single-handed. Cooper relayed an important message to tracking station, Muchea, near Perth, Australia. The astronaut reported a sighting of a green-hued glowing object approaching his capsule. The alleged UFO was picked up on his radar, but Cooper was advised not to speak about the sighting. He had attested to seeing a UFO nearly a decade prior to this flight. He was piloting an F-86 Sabre jet over western Germany. Cooper spoke to the United Nations, and on many other accounts, stating astronauts “live in secrecy because the US fears the public’s reaction.” The green light comes up in a recent CNN report the second day of Jan. 2014. Tom Watkins with CNN reports an elaborate crop circle was found on a farmer’s property in California, just two hours south of San Francisco. 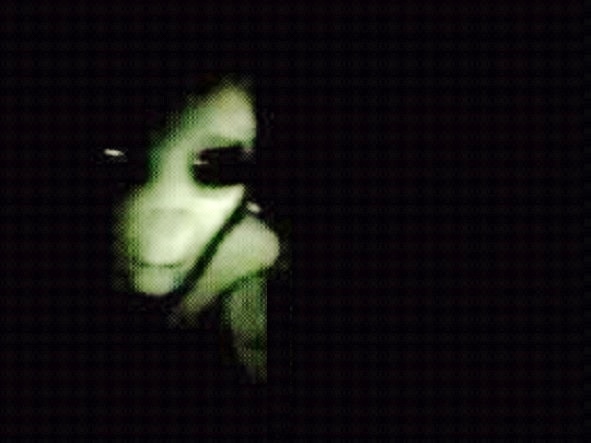 Green lights were seen and recorded by an onlooker. 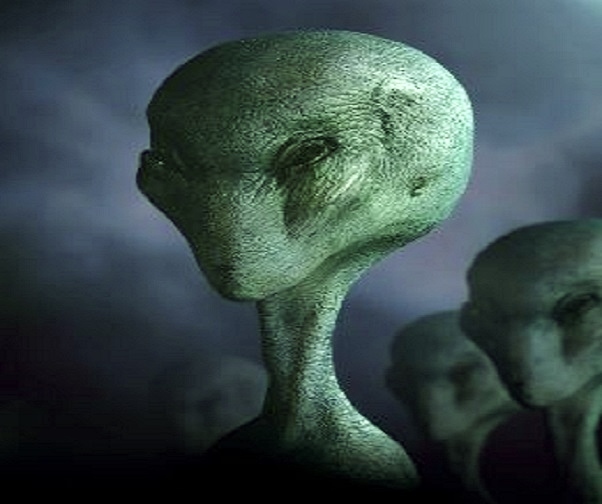 Many people speculate between aliens and hoax. However, the crop imprint being circular is similar in description as most UFO reports maintain. Other NASA astronauts listed on syti.net UFO sightings page include Donald Slayton who was also a Mercury astronaut. He claimed to have seen a UFO during a flight in the P-51 fighter jet, 1951 Minneapolis. The object appeared to him like a kite at first, but the object soon presented itself as a saucer-shaped aircraft. He went after the proclaimed UFO at 300 miles per hours until it vanished. Major Robert White in 1962 also reported a UFO sighting. White was test flying an X-15 which was also flown by a Joseph A. Walker the same year. Walker was a NASA pilot with the task of actually detecting UFOs. He alleges filming many sightings, though the film was never released. 1973 Apollo 17 commander, Eugene Ceman, states in a Los Angeles Times article, thinking the UFOs were somebody else, from a “different civilization.” Edward Higgins White (the first American to walk on the moon), and James McDivitt in 1965, are reported to have taken photographs of a metallic UFO with long arms stretching out from the body. One might wonder if these were simply objects from other, more advanced countries. However, more astronauts have been listed to further the claims of extraterrestrial life. James Lovell and Frank Borman reported on base radio from outer space during their 1965, 14-day record-breaking flight, “Bogey at 10 o’clock high!” 1969 Neil Armstrong and Edwin Aldrin report a mysterious experience on the moon. A transcription of what syti.net claims was transmitted: NASA: What’s there? Mission control calling Apollo 11. Apollo 11: These “Babies” are huge, Sir! Enormous! Oh my God! You wouldn’t believe it! I’m telling you there are other space craft out there, lined up on the far side of the crater edge! They are on the moon watching us!” Armstrong claimed there was a base on the moon, and he was warned to stay off the moon by the aliens. He would not go into further details indicating that the CIA was behind the cover up. 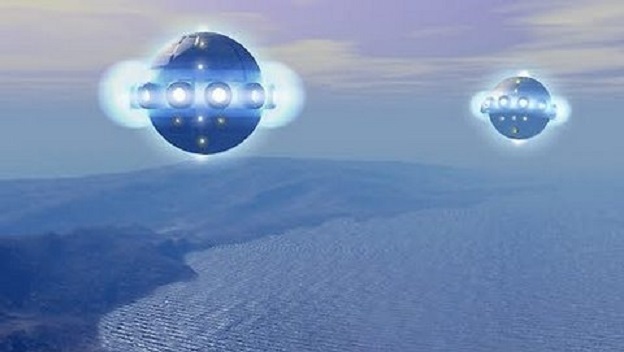 Maurice Chatelain 1979, former Chief of NASA Communications Systems, confirmed Armstrong did report seeing the UFOs. Chatelain spoke about code name “Santa Claus” which began as a result of Walter Schirra on Mercury 8 who attributed the name to any UFO sighting. James Lovell followed this usage and spoke the words for all the public to hear, “Please be informed that there is a Santa Claus.” Scott Carpenter, an American astronaut, aquanaut, and test pilot was one of the original astronauts for NASA’s Project Mercury in 1959. He allegedly stated, “At no time, when the astronauts were in space were they alone. There was a constant surveillance by UFOs.” The reports on NASA astronauts UFO sightings do not end here. This week of February is the 23rd annual International UFO Conference in Fountain Hills, Arizona. Researchers, a former NASA astrobiologist, and ordinary people looking to share their personal stories will be there. The organizer, Maureen Elsberry, hopes to produce “digestible,” and scientific information to the general public about extraterrestrial life. NOTE: The above image is a rendering. THANKS TO WWW.UFOCASEBOOK.COM AND Lindsey Alexander. Multicolored fiberoptic looking sphere.The object first caught my attention, because the sky was so clear, you could see everything.The object seen first looked like an extroardnarily bright star, just larger. After paying closer attention to it, we realized these beautiful colors all over the object. I then retrieved my binoculars for a closer look and what we saw was just amazing, and so vivid. There was no haze, no aura, and it just remained in the same spot for about a half hour until it slowly(at least slow to the naked eye) began moving south. Also to clarify the location, it was east of where we were and we were looking to about a 45 degree angle. The sphere then paused again and seemed to remain in its new location, for the remainder of the sighting. I had viewed it through the telescope also which made it that much more clear, only to reveal a spherical shape just completely covered in this constant changing, almost electrical light. It was blue,purple,red,yellow, green, and it just kept cycling through these colors over and over again. To be more precise on the shape, it looked exactly like the big Epcot center ball (with the same outer texture or paneling) in Disney World, just bigger and luminescent. I also found it pretty peculiar that at no time during this sighting was there even a trace of any other aircraft in the sky, and the air traffic is usually constant. NOTE: The above image is a rendering. Family dog had to go out back at 10.50 pm plus or minus a couple of minutes. Had my 5 million candle power light with me when taking her out at night due to coyotes and bobcats. Shined my light around the back yard as I always do and once I was looking in the Northeast direction I noticed almost right away (3) craft with (4)large bright orange/ reddish lights each, traveling from the Northeast, traveling directly over my back yard heading Southwest towards Phoenix. Thought, in the first couple of seconds, that the lights were a type of aircraft, but realized quickly that these were not our aircraft. The (3) craft were in loose formation, not exactly a perfect triangle, but close together. 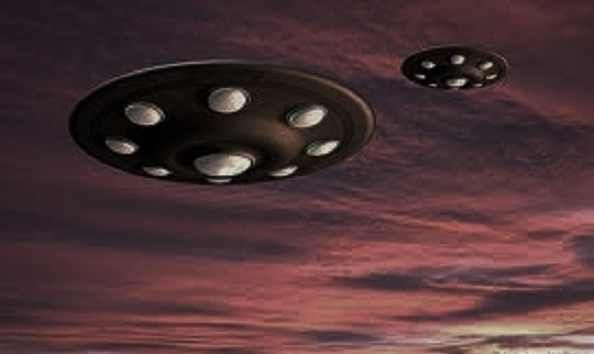 Each craft, on the underbelly, had (4) bright Orange/red glowing lights forming a square about the size of a (2) car garage.Estimated these craft to be at about 1500 feet to 2500 feet above ground level. As they traveled directly over my back yard I noted that there was no noise from a propulsion system, completely silent. Crafts were moving faster than a balloon or blimp but much slower than a plane and were in a controlled flight pattern. Went back inside home and pulled wife out of bed. When she saw them she asked what they were. I commented that they were Unidentified flying objects. She told me to get my camera and get some pictures. Ran in and got my camera. Took quite a few pictures and pictures do show orange/red glow. One of the (3) crafts sprinted ahead of the other two crafts and turned off its lights when it got close to Phoenix. Pictures that I took show (2) Orange/red glowing orbs. After approximately 6 minutes the last two crafts were so far to the south west that we couldn’t see the lights anymore. My wife is my witness and the pictures that I have show (2) glowing orange/red orbs.Both, my wife and I were amazed by the sight of these objects and had a hard time believing what we had seen. But did get it on my camera. Not good enough to show any detail but does show (2) glowing orbs. NOTE: The above image is a rendering. I was on a commercial airline flight from Tennessee to Southern California on February 4, 2014. I was looking out of the port-side windows, observing the blanket of cloud cover. I then saw a black object moving in roughly the opposite direction of the aircraft I was in. The object was flying a bit higher, but within a few hundred feet of the altitude of my aircraft. We had reached cruising altitude, which for a domestic flight may have been approximately 20,000 feet. I estimate the object’s distance as approximately 1,000-2,000 yards away from the aircraft I was in. The objects shape was rounded; not a sphere, but with width and height that were approximately the same length. The object had rounded details that protruded both from the sides and from top to bottom. The object was very dark black in color. At first glance I thought the object was another plane moving the opposite direction. As I continued observing the object I saw that it was moving at a pace that was unusual. It was at that time I also mentally noted the objects black color and unconventional shape. It was moving in a very straight line at a fast pace, one that did not seem at all consistent with a commercial or known military aircraft. The pace of the object surprised me and made me observe it more closely. At this time, after observing the object for less than 10 seconds, I looked down at my phone briefly, for only a second or two. I then looked immediately back to where the object had been and it was nowhere to be seen. When I had looked down, the object was not about to pass behind my place and out of sight. I was startled to see that the object was no longer in the sky, and leaned forward to look out of the window farther towards the front of the airplane, where I could look farther behind us. The object was gone. 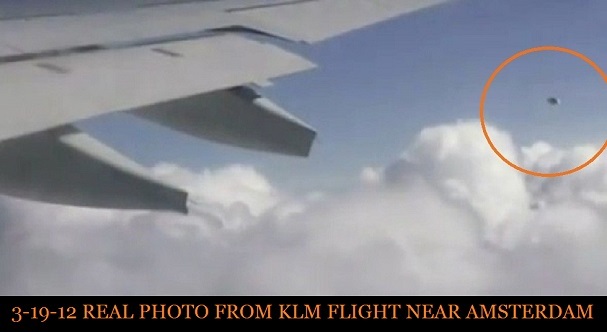 NOTE: The above real photo is from a KLM flight to Amsterdam on March 19, 2012. I am the pilot of a regularly scheduled commercial aircraft flight from St. Louis to Kansas City and was on approach to KCI when my co-pilot said he saw an unidentified object to the right of the aircraft that appeared to be following us. It was not yet in my range of view, so I asked him to confirm that and the object remained. I radioed the tower and asked for radar confirmation but there was none. Then the object came into my view to the right front of the aircraft. At that point we were approximately 35 minutes out from the airport. The object was a silver/gray color and had three blue/white lights on the bottom and one on the top. It was a disc-shaped craft with a low dome on top. It was approximately 300 feet from our aircraft and NNE of our position. Then the object suddenly moved underneath us and to the left, and continued at the our same rate of speed. I discussed this with my co-pilot and we decided not to tell the tower what we saw because of what happens when reports like this are made. The tower then asked us to confirm an unidentified object and I said it was no longer in view. I was concerned, however, that it might be a problem. The object stayed with us for approximately 22 minutes. When I decreased aircraft speed for approach, the object slowed as well, then went directly south of our position at a very high rate of speed – faster than any aircraft I’ve ever seen. I was a military pilot for 14 years and know what type of aircraft we have. It was definitely NOT a man-made aircraft. Some pilots have lost their jobs when they report a UFO, and I would like to keep mine so am not providing my name or contact information. Some of the passengers were discussing this as they left the plane but we did not discuss it with them. Other crew members saw it as well, but did not report it. I just wanted to tell someone about it. NOTE: The above images are renderings. I was visiting NY all Winter 2006 but before I had the opportunity to visit a friend in Orlando. The house where I was doing some work in exchange of the mini apartment upper the garage was big and cold, I have some pics of the place I can send you later. It was one night during a painful menstrual period that didn’t allow me to sleep, I feel very sad because it happened that I was thinking of my daughter, at that time I felt I wanted to come back to Peru because I didn’t like the snow and the cold weather, so at around 2:20am I saw a potent illumination outside the window but it was so bright that look white, the trees look white but actually that intense light kind of move the leaves as if there was some wind some sort. At that point the first thing I wanted to do is see what was going on because it was winter in a wooded area where you can even see the moon, and the window blinds were shut in between just in case I can have some light because I am not used to sleep with not lights, I always keep the bathroom light on. Well, when I noticed this was not just an illumination but there were two balls or spheres kind of white and glowing with some blue moving from left to right from the point I was seeing them, I could hear a sound that I cannot express but it was not metallic sound, it was very soft like when you use your breath to clean your glasses, something like that, I don’t have the name in English. Then one ball follow the other up and left and after that the blinds opened one by one as if two fingers where opening to see me, and I realized I couldn’t move at all or scream. When I saw something like a vapor coming thought the close window that terrified me and noticed a formation of a woman with big eyes in front of me but I had no choice to refuse to look, otherwise I would have been taken, so the only thing I did was tell this being I do not want to go and that I couldn’t have children any more because I had three miscarriages before and for some reason I don’t understand is that I supposed they wanted something from me. Do not remember more up to the point the balls disappeared in front of my eyes like when you turn off the lighter or flash light. I recovered movement after that and next day was still frightened and for several weeks after I couldn’t sleep thinking they were coming back. Since that happened, I have seen UFOs flying close as if they show to me and it happened last Summer by the Mohawk River, the UFO got in a cloud then went out again, and when I was waiting to see it again it didn’t come out again but it looks they play or know I am watching. 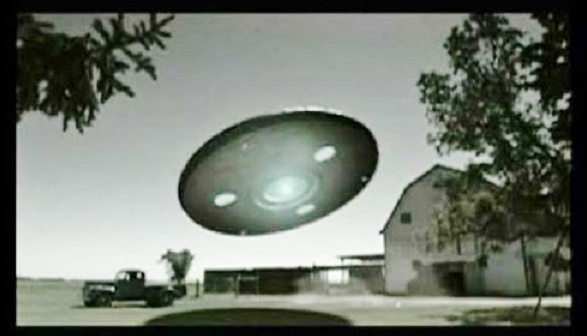 The other UFO flew like a bird from side to side and the top was silver like color and the bottom black and flew faster than an airplane and was 6:30pm on a cloudy Summer day. When I look up the sky I saw them all the time because I observe the stars specially during Summer, but my husband do not believe it and even seeing it think that the stars can fly, hahaha. I was thinking about a regression to corroborate they didn’t do anything against my will. There is another thing I can share with you is that when I was a little girl I was kind of indigo child, very intuitive and I can remember a lot of things since I was a baby and the things I saw. When I was 9 years old I had a car accident and I was sent back because you don’t recover from that type of accident, so everybody thought I was dead, but when I woke up myself everybody were scare of me and didn’t want to touch me, that happened years ago, now I am 47. You tell me what you think, what kind of beings are these? have you heard about these encounters? NOTE: The above images are renderings. SPECIAL THANKS TO THE WITNESS A. L.
“It followed after the changes that occurred in Russia all kinds of things went on sale. The KGB files were sold in their entirety to Yale University, and two U.S. film companies bought the rights to the KGB UFO files. Soviet scientists and cosmonauts also came forward with what they knew. In 1990 Colonel Marina Popovich held a press conference in San Francisco at the Russian Consulate. During the conference she showed amazing photographs of cigar-shaped alien craft in space that were each, fifteen miles long. The photos were taken by a Russian space, probe which mysteriously stopped working, then disappeared completely, shortly after taking the photographs.] For more information on missing space probes see “Star Warsand Satellites” page. Popovich knows her stuff. Besides being a colonel in the Soviet Armed Forces, she is also the wife of famed cosmonaut Pavel Popovich. Pavel Popovich was head of a Soviet Committee on UFOs.] During half of our orbit. We observed it on the light side, and when we entered the shadow side, it disappeared completely. 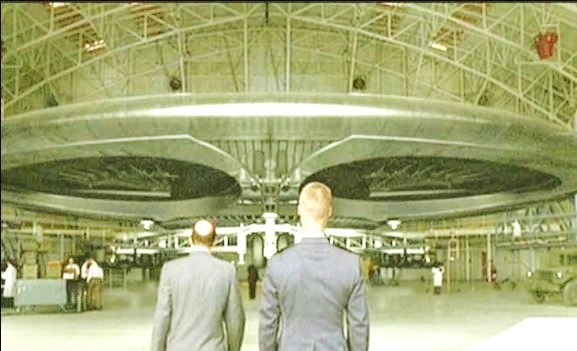 It was an engineered structure, made from some type of metal, approximately 40 meters long with inner hulls. The object was narrow here and wider here, and inside there were openings. Some places had projections like small wings. The object stayed very close to us. We photographed it, and our photos showed it to be 25 to 29 meters away.” – Cosmonaut Victor Afanasyev commenting on a UFO sighting that occurred while en route to the Solyut 6 space station in April of 1979. 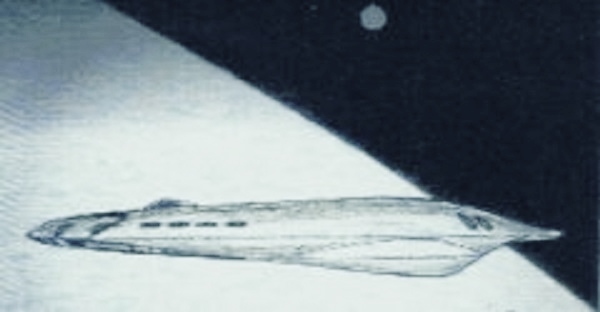 Cosmonaut Adanasyev made a drawing of the space ship he witnessed from aboard the Soviet orbital vessel. 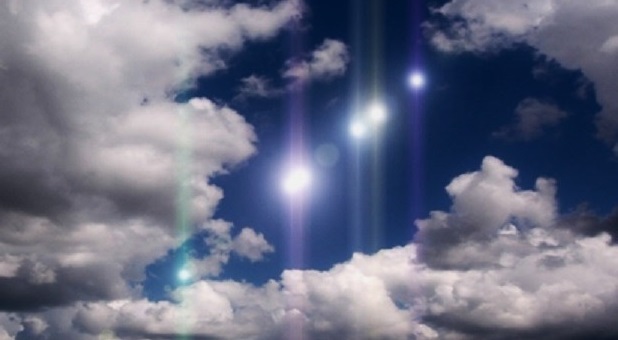 (top photo) Victor states, “I think we are not alone, something of extraterrestrial origin has visited Earth.” The alien craft turned toward ours, followed us and flew formation 25 to 29 meters away. We photographed the metallic engineering structure that was around 40 meters long. The film was later confiscated. Sourse: Rense.com and Filer Files NOTE: The above image is a rendering except for the drawing from the Cosmonaut. In his chapter for “UFOs,” French Major General Denis Letty reports on the case of Air Force Captain Jean-Pierre Fartek, then a Mirage III pilot, who had seen a UFO in 1979. Captain Fartek’s case was most unusual, because the sighting did not occur while he was flying, but had taken place at his home in a village near Dijon, during the day. He and his wife witnessed an oscillating object hovering low to the ground, in front of a row of apple trees. General Letty met with them at the location, and wrote this in his notes during the interview: “The object looked like two reversed saucers pressed against each other, with a precise contour, a gray metal color on the top and dark blue below, with no lights or port-holes.” The clarity and precision of the shape of the object left no doubt that it was something solid and physical. He provided many more details, as Letty describes. The similarities between the object described by the three Captains — Guerra,Schultz, and Fartek –- in different countries and in different years, are both suggestive and fascinating. Captain Fartek submitted a report to the Air Guard Station at the base, and he was instructed not to talk about what he saw. Letty writes that Fartek, was very upset by this experience. “He told me when we met that the sighting called into question his perception of what were then called ‘flying saucers,’ because he had never believed in them,” Letty says in his chapter. “Now, he acknowledged to me that after seeing this craft he could no longer doubt their existence. Hearing his testimony, I too did not have any more doubt about the reality of the Phenomenon. In fact, taken together, I found the Farteks’ testimony so disturbing that I have been preoccupied by the UFO problem ever since. In 1996, after he became a Major, Commander Fartek was interviewed for the COMETA study which I initiated, and even then, after seventeen years, he was still visibly shaken by what he saw.” NOTE: The above image is a rendering. I have worked 12 hour nights for almost 3 years now. I am an avid night sky watcher (meteor showers, planet conjunctions, satellites spotting, comets, I.S.S. passings, etc. ), so I am quite familiar with “normal” night sky sightings. On the night of January 20th 2014, I saw something I’ve never seen before. As I was walking out the back door of my workplace to smoke a cigarette at 11:25 pm EST, I first noticed the moon about 25 degrees off the horizon straight in front of me. It was the first clear night we’ve had in at least a week. As I was looking at the moon a bright light traveling northeast caught my eye. This light was traveling pretty much in the same location from my vantage point as the moon so it was easy to see. My first initial thought was that this bright light was the I.S.S., so I ran to my truck 10 feet away and grabbed my binoculars to look at it. I put my elbows up on my truck so I was steady and found this bright light through my binoculars. What I saw as one solid bright white light with naked eye turned out to be a triangle shaped UFO, with 3 lights. I could not believe what I was seeing. I watched it for 30-40 seconds as it traveled away from me. The details of this object: the front light of the triangle was a huge solid white light. It did not change color or blink. The back 2 light were the same size but were flashing at random it seems from, white/red/blue. The elevation was probably a little higher than normal helicopter traffic. Although, since it was dark it was hard to tell. I saw this thing clear as can be through those lenses. I’m not particularly happy I saw it as everyone I’ve told has laughed at me, thought I was joking around, or just don’t believe me. But, I stand by my story, I know what I saw. NOTE: The above image is a rendering. KENS NOTE: I have investigated numerous triangle sightings over Southern New Jersey. 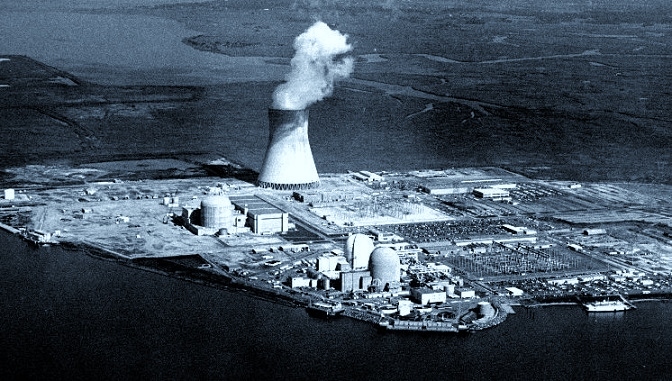 Salem nuclear plant is located in Salem and its right on the Delaware river. I feel the Nuclear planet is the reason why we have been receiving these sightings. 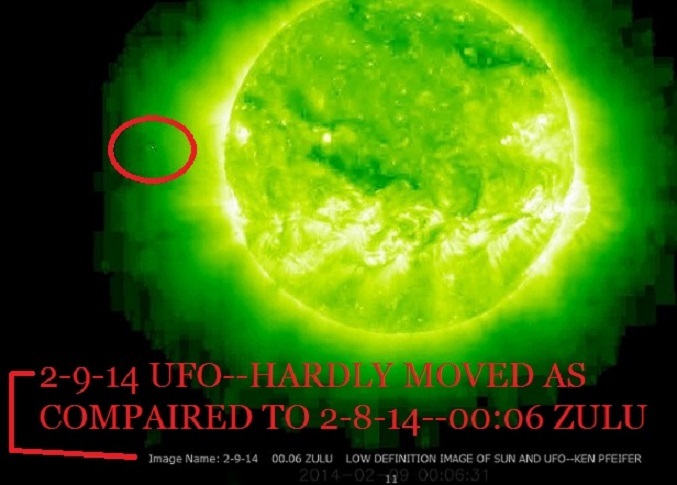 A UFO was noticed from SOHO project’s photos released by NASA. It was discovered and posted by YouTube user Myunhauzen74. The video seems to show an object making an intelligent movement, ruling out a comet or other space bodies. Its size would appear to be the same as the Earth based on the Sun’s perspective in the photos. The SOHO is a joint project of the European Space Agency and NASA. The orbital solar telescope has been taking photos of the Sun, solar flares and any activity around the Sun. It is placed 1.5 million kilometres from Earth. The data sent from the telescope is loaded in the website of NASA without editing, giving UFO researchers a chance to examine the raw images. Report about a UFO around the Sun is not new. In fact, there are hundreds of reports about the anomaly around the Sun involving an unidentified flying object. American meteorologist Scott Stevens has even made a theory about it saying that solar flares are results of space aliens’ experimentation. He said in an interview that he believes UFOs are flying around the Sun. KENS NOTE: I have been tracking and downloading these events every day for a few years. The objects are the size of planets or much larger. I really do not know what they are because of the heat generated from the Sun. You would think anything would burn up thousands of miles from the Sun but this is not the case. Now if NASA came out and said ” its molten material being blasted out into space from the Sun “, I could deal with that. It would make sense to me but I have not heard any explanations from NASA about this phenomenon except for some egg head explanation that makes no sense to me. “Double talk” is an art with NASA. Check out my Sun gallery on www.worldufophotos.org . I have approximately 1,100 photos of the Sun with these objects highlighted. A couple years ago NASA displayed high definition images on the SOHO web site but in January of 2011 the hi-definition images went away. Now they are low definition images but they are still good to see this phenomenon around the Sun. The images enclosed are a few of the finds I have on the Sun. My theory is these craft are possibly using the energy of the Sun to fly their ships through space. 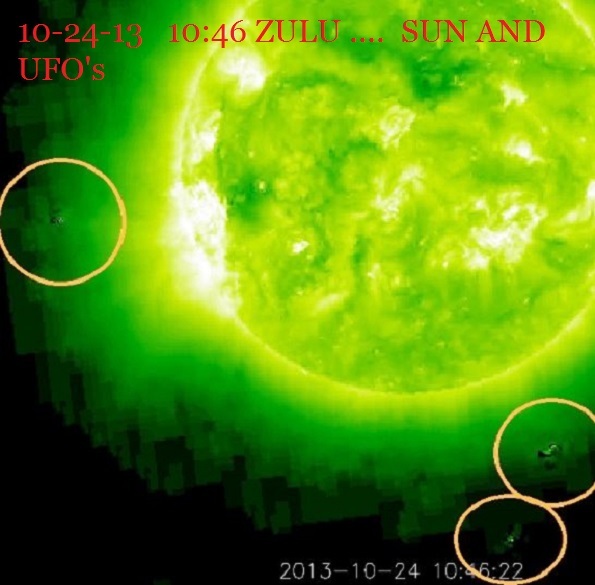 I have enclosed 4 images of the Sun and UFO’s. 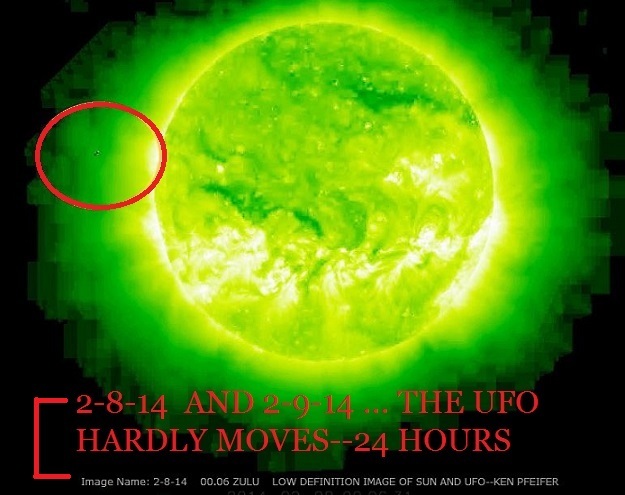 Two of the photos are a prime example of these objects hardly moving within a 24 hour period….Of course, to you debunkers and so called scientist, they probably moved a million miles in one direction or another but look at the image. 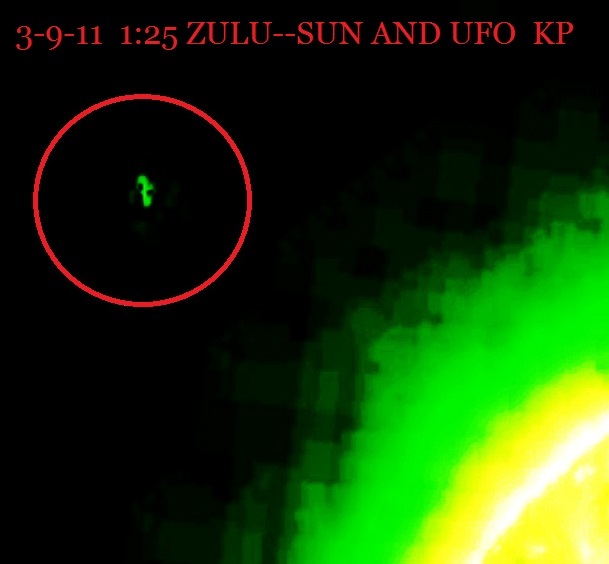 I am interested to see if the object will be there tomorrow at 00.06 Zulu. There have been rumors floating around for many years that the first Russian contact with “grey aliens” allegedly took place in 1942. At the time, a series of diplomatic visits to discuss matters of mutual concern were planned, according to alleged Russian documents and a treaty was made, Voice of Russia writes. 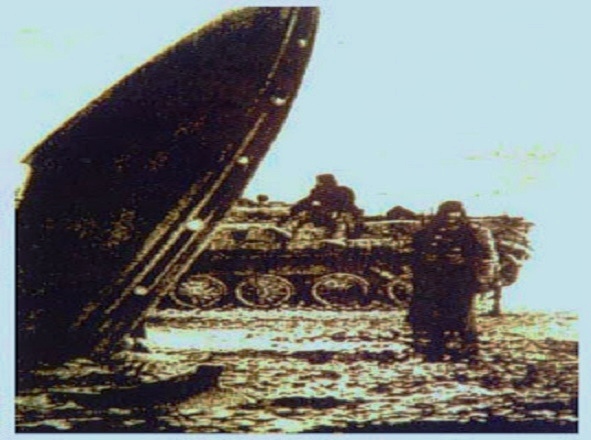 In 1969 in the state of Sverdlovsky, a UFO was reported to had crashed and was recovered by the Russian military. 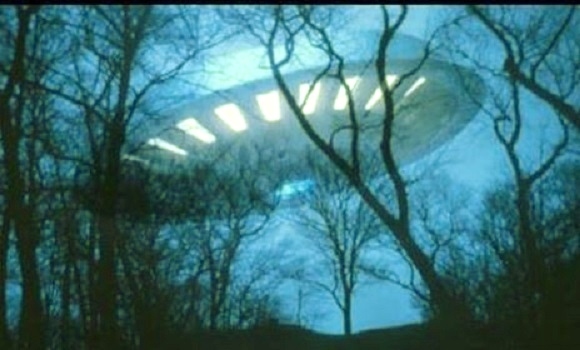 There is an alleged video footage showing the recovery, with close-ups of the UFO itself. Allegedly, there was one dead alien found in the craft. 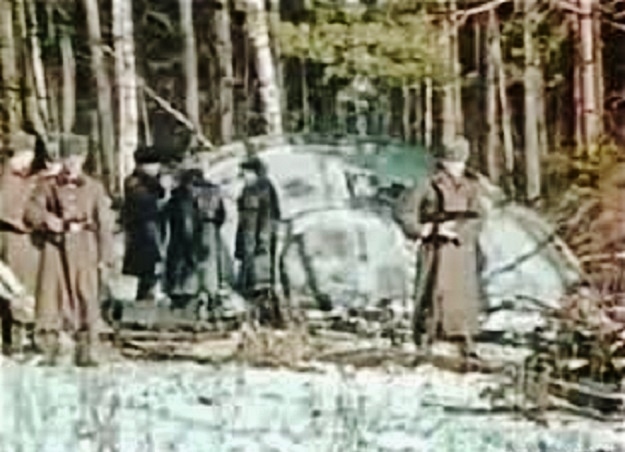 The remains of the alien and the UFO debris were taken to a secure Russian site, where the saucer was analyzed, and an autopsy done on the alien. According to Russian newspaper “Pravda”, the KGB has allegedly had a special unit designed to gather and monitor all pieces of information regarding mystical and unexplained phenomena reported inside and outside the Soviet Union. Also according to Pravda, General A. G. Ponomarnko, head commander of the Urals military district, was to ensure that KGB agents be involved in the work pertaining to the UFO at all stages. The agents’ reports were promptly forwarded to Colonel A. I. Grigoriev, chief of the KGB scientific department. According Billy J Booth on About.com there are unsubstantiated reports that a UFO crashed or was shot down near the city of Prohlandnyi, in the USSR at on August 10, 1989.